The best soccer dvds for both soccer coaches and players. I'm sure you've heard this advice before from a youth soccer coach or friend, but if not, here it goes: if you want to become a better soccer player then watching and copying the skills of the best soccer players in the world is the way to do it. Pick out a soccer player you admire and see if you can watch all their games live in person, on TV, or on a soccer highlight or soccer skills DVD. And that's just what we've put together below, soccer DVDs and videos from some of the best players and coaches in the game. Watching these videos will help you become the best soccer player or coach you can be. It takes work and dedication though if you want to get better. There's no magic pill you can take or after watching these soccer DVDs you'll al of a sudden become Messi or Iniesta. No, you need to watch the skills or highlight video and then spend time practicing the moves and skills. There are some instructional DVDs in the list below as well as DVDs that focus on just one player, say Maradona for example. Also, don't forget to check out our top five soccer training DVDs. 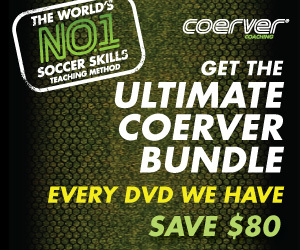 Learn the skills and gain the confidence to succeed in the game with Coerver Coaching’s Make Your Move DVD series! Built around our unique and highly effective Pyramid of Player Development, the exercises on these discs build an all-around soccer competitor with advanced skills for handling the ball alone and against the competition during attack and defense. 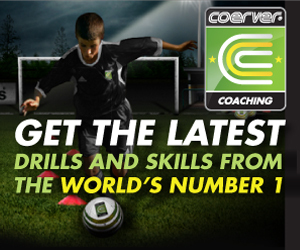 I'm sure you've heard of the Coerver Coaching method, but if not, this is the world's number one soccer skills program for develping top level soccer players. Dutch European Championship winning coach Wiel Coerver led a revolution in soccer coaching. He was dissatisfied with the lack of individual skills and emphasis on defensive play in the professional game; an emphasis that many thought, was stifling the more exciting, attacking style of play necessary to score goals and attract fans. Buy it here as a DVD or watch it online. Extended highlights featuring all the goals from every 2006 Barcelona Champions League Match, and the full match final. English and Spanish commentary included. Disc One: Road To Paris After a 14 year absence, FC Barcelona have once again reached the pinnacle of club football and have been crowned UEFA League Champions. This fantastic double DVD shows FC Barcelona's 'Road To Paris' including the best moments from all their matches, interviews with the greats of the club, insight from the management and the eventual celebration in the Camp Nou. Disc Two: Full Match Final FC Barcelona v Arsenal - Ronaldhino v Henry - set up one of the most eagerly awaited games in years. Some of the world's best players competed in Paris for the most valuable and sought after prize in club football. Controversy, goals and superb skill showed the world a game to remember; this 2 Disc DVD preserves that history and FC Barcelona's ultimate triumph: a must for all football fans. Take your game to the next level and learn to play like a champion with Sir Alex Ferguson and the first team players of Manchester United! Along with the club's Academy players, you can learn skills like the Flick Behind, the Step Over and the Roller Coaster. With unprecedented access from the training ground to the heart of Old Trafford you can find out what makes Manchester United one of the most exciting teams in the world! To purchase click here! A collection of 20 different moves that will leave your opponent standing. Each move is detailed and shown at match speed and in slow motion. What appears to be complex is made easy for players of all ages and abilities. Plus, in this easy to learn system you get to see World Class players putting the moves on their opponents. To purchase click here! Manchester started life as Newton Heath, a team founded by workers from the Lancashire and Yorkshire Railway in 1878. This is where this program starts, recounting the history of Manchester United. Honors soon followed and the first of seven First Division titles was won in 1908. With an FA Cup win the following year, and another league title two years later, Manchester United were firmly establishing themselves as a force in English football. The era of great success and tragedy under the inspirational management of Sir Matt Busby and the Busby Babes. Charlton, Best and Law won the European Cup. Sir Alex Ferguson built the team of the nineties that have gone on to win seven premiership titles over the last ten years. Built around home-grown talent and inspirational signings (such as Eric Cantona), Manchester United moved into an era of unrivalled success which culminated in the remarkable treble of 1999. But Manchester United's history does not stop there. Further championships followed in both 2000 and 2001 and this program finishes at a time when Ferguson, through the signings of Ruud van Nistelrooy, Juan Sebastian Veron and Rio Ferdinand is building another team worthy of success at home and in Europe. In the history of the game few players have achieved the fame of Diego Armando Maradona. Success and turbulence have surrounded this superstar whose name is synonymous with world class soccer. Follow Maradona from the days of his youth in Argentina, to his brilliant and unforgettable performance in the 1986 World Cup and the drama surrounding his performance and departure from the 1994 World Cup. His genius, his style, his athleticism and his temperament combine to secure his place in soccer history. No other player can match his combination of talent and skill and the ability to surround it with controversy and drama. The entire history of the world's favorite game? It's an extraordinary challenge that could go have gone horribly wrong, but History of Soccer: The Beautiful Game is a class act. It boasts top-drawer production values, including narration by Terence Stamp, access to everybody who has really mattered in the game, ever, plus loads of famous, rare, and never-seen-before footage, each volume offering a blend of narrative, action, and illuminating interviews. This is a polished product: part celebration, part commemoration, but always with a sharp investigative sense, digging around the misty-eyed, good ol' days tradition, to explore in the company of those interviewed the reality behind some of soccer's myths and legends.